Plenty of companies have been rushing to put out healthy ice cream so we can all stress eat without consequences. This is a noble pursuit, but it has a fundamental flaw. Part of the satisfaction of housing an entire tub of ice cream is that you're making an almost indefensible choice -- and you're doing it anyway. It's liberating. 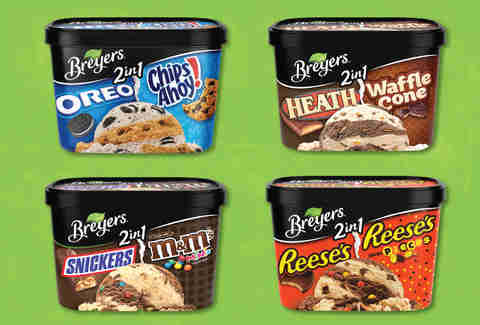 So it's comforting to know that some are going in the opposite direction and keeping indulgence alive, like Breyers is with its new 2in1 ice creams. 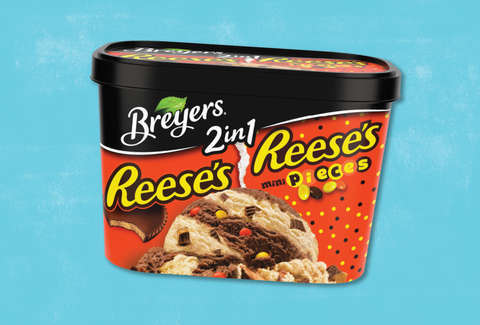 As the name suggests, these tubs of ice cream feature not one flavor, but two. But there aren't just two types of candy loaded in there. Each topping is in a separate flavor of ice cream, and those ice creams are mixed together. It's a level of decadence not seen since the fall of Rome. Heath & Waffle Cone: Heath in vanilla ice cream mixed with fudge-covered waffle cone pieces in chocolate ice cream. So, just embrace eating two different types of ice cream with two different types of candy all at once, and tell yourself you've earned it if that helps. James Chrisman is a News Writer at Thrillist. Send news tips to news@thrillist.com and follow him on Twitter @james_chrisman2.